Courtesy Photo | Sgt. Benjamin Paige (right), and Sgt. Joseph Tucci (left), of the 709th Military Police Battalion pose with their military working dogs at Camp Bondsteel, Kosovo, December 6, 2018. The Soldiers and working dogs perform force protection and security operations in support of the NATO mission at Camp Bondsteel. CAMP BONDSTEEL, Kosovo — In southeastern Europe, a camp represents an essential command and supply hub for NATO operations throughout the region. It is also a crucial staging ground for U.S. forces deployed in support of Operation Joint Guardian forming Multi-National Battle Group-East. The camp is Camp Bondsteel, Kosovo. Helping to secure this vital NATO hub are two Military Working Dog Handlers and their dogs from the 709th Military Police Battalion, 18th Military Police Brigade, headquartered on Tower Barracks, Germany. Sgt. Joseph Tucci and Sgt. Benjamin Paige from two separate Military Police Detachments execute force protection and anti-terrorism operations every day in support of the NATO mission in Kosovo. In the summer of 2018, both Soldiers deployed on their own to Camp Bondsteel. 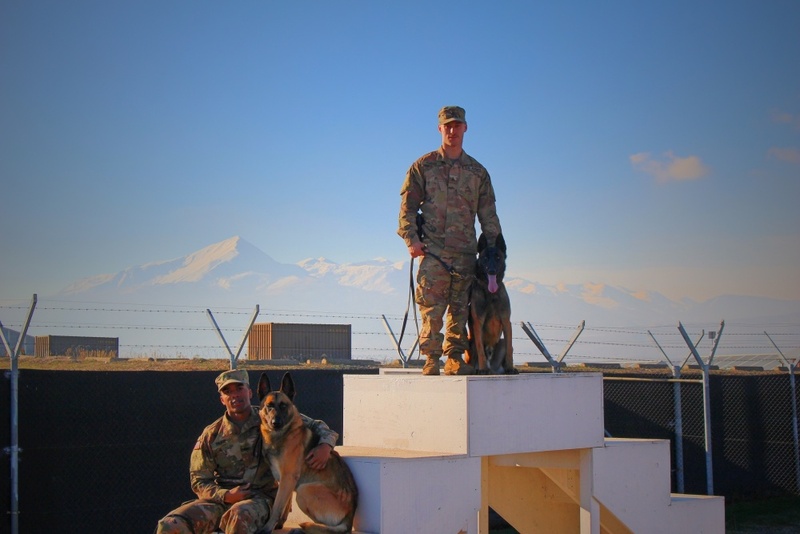 The two non-commissioned officers execute NATO missions, care for and train their Military Working Dogs, Junior and Csoki, maintain Kosovo’s only kennel, and assist with Law Enforcement operations. The handlers are self-sufficient, living separate from the other Military Police Soldiers on Camp Bondsteel. In a recent visit to Kosovo, Lt. Col. John Copeland, the commander of 709th MP Battalion and Command Sgt. Maj. Joshua Kreitzer, the battalion command sergeant major, recognized the NCOs for their work in running the kennel. “They epitomize what it means to be a disciplined warrior that is ready to fight tonight,” Copeland said.